Ten years ago the U.S. Senate’s unanimous approval and designation of a week in June as “National Pollinator Week” marked a necessary step toward addressing the urgent issue of declining pollinator populations. Pollinator Week has now grown into an international celebration of the valuable ecosystem services provided by bees, birds, butterflies, bats and beetles. The Pollinator Partnership is proud to announce that June 19-25, 2017 has been designated National Pollinator Week by the U.S. Department of Agriculture and the U.S. Department of the Interior. Watch Solar and Pollinators, a Fresh Energy Webinar this Thursday, June 22nd from 12 to 1 p.m. 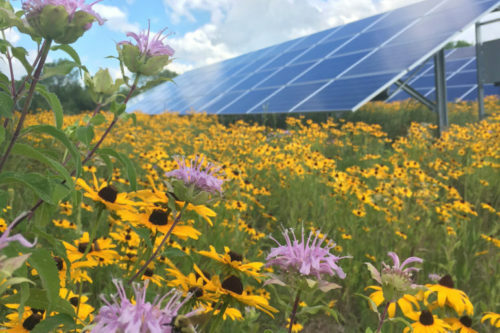 This entry was posted in NewsBlog and tagged economic benefits of pollinator-friendly solar sites, Fresh Energy, National Pollinator Week, Nebraskans for Solar, pollinator-friendly solar sites, U.S. Department of Agriculture (USDA), U.S. Department of the Interior on June 20, 2017 by Helen Deffenbacher.